The Big Scarecrow Welcome is built in our workshop. The scarecrow is hand painted in blue suspenders. The scarecrow has a red and white checkered shirt. He has a brown hat with black crows sitting on him. He is holding pumpkins that read Welcome. The dimensions for the sign are 33.75 inches tall by 23.50 inches wide by 2 inches deep. The dimensions for each pumpkin are 3.75 inches tall by 3.75 inches wide by .50 inches deep. The sign has a 31 inch stake. The weight with packaging is 6 pounds. For the continental U.S. shipping and handling is included in the listed price. For shipping outside the continental U.S. please contact us through our Contact Us page. The Scarecrow Welcome is built in our workshop. The scarecrow is hand painted in a blue and green outfit with patches. 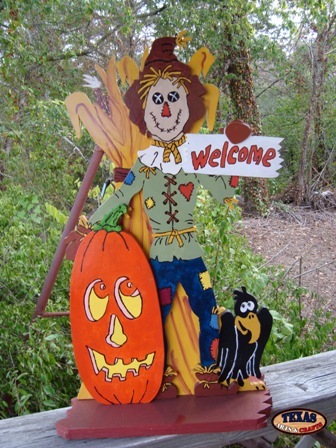 The scarecrow is holding a sign that reads Welcome. There is yellow hay behind the scarecrow. It is standing by a orange pumpkin and a black crow. The dimensions for the sign are 30.75 inches tall by 17.75 inches wide by 8 inches deep. 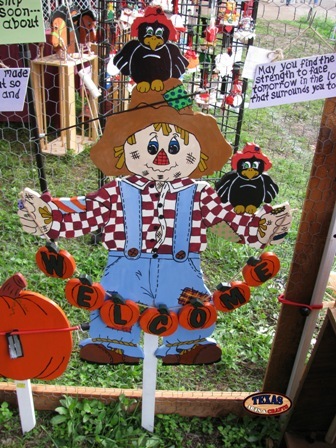 The Scarecrow Welcome is a local item only and can be picked up from our store or at our crafts show. The Hay There Scarecrow is built in our workshop. The scarecrow is hand painted with yellow hay, a blue and white outfit, and a brown hat. The pumpkins are painted orange. The wood sign reads Hay There. The dimensions for the hanging sign are 15.50 inches tall by 10 inches wide by .50 inches deep. The weight with packaging is 2 pounds. For the continental U.S. shipping and handling is included in the listed price. For shipping outside the continental U.S. please contact us through our Contact Us page. The Happy Harvest With Three Pumpkins is built in our workshop. A scarecrow is hand painted onto an orange pumpkin. The sign reads Happy Harvest. The three pumpkins are painted orange. 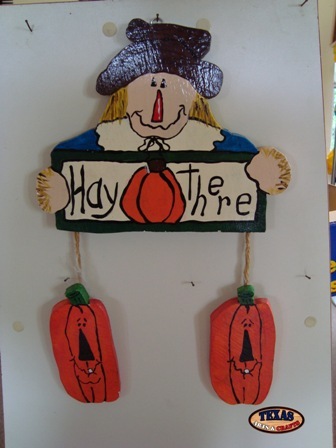 The dimensions for the Happy Harvest sign are 4.75 inches tall by 5 inches wide by .75 inches deep. The sign has a stake that is 24 inches tall. The pumpkins are 5 inches tall by 5 inches wide by .75 inches deep. The signs have a stake that is 24 inches tall. The weight with packaging is approximately 2 pounds. For the continental U.S. shipping and handling is included in the listed price. For shipping outside the continental U.S. please contact us through our Contact Us page. The Happy Harvest With Two Pumpkins is built in our workshop. A scarecrow is hand painted onto an orange pumpkin. The sign reads Happy Harvest. The two pumpkins are painted orange. 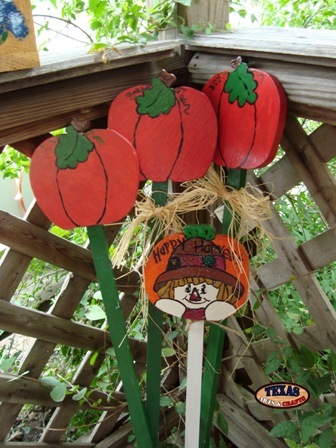 The dimensions for the Happy Harvest sign are 4.75 inches tall by 5 inches wide by .75 inches deep. The sign has a stake that is 24 inches tall. 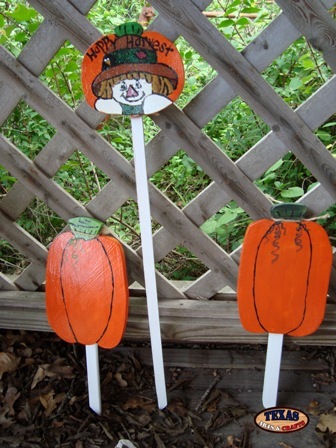 The pumpkins are 8 inches tall by 6 inches wide by 1.50 inches deep. The arts and crafts signs have a 11.50 inch stakes. The weight with packaging is approximately 2 pounds. For the continental U.S. shipping and handling is included in the listed price. For shipping outside the continental U.S. please contact us through our Contact Us page.